If you have reached this page because you're wondering whether a smart-pill called Adderin is a scam, the answer is, yes it is. Like a number of other smart-pills (all of which probably share similar worthless formulas), Adderin is being sold to unsuspecting senior citizens and others by means of a fake news report -- i.e. a report that looks like it might actually be from CNN, or from Forbes, or from Discover Magazine (and doubtless others as well), but which is actually totally fake. You can tell that it's totally fake because the exact same ad is used to sell products with different names. This blog documents the ones that I have seen, or that readers have pointed out to me. Below is the Adderin scam. I assume the software was smart enough to know that I was in Virginia. What luck, it's banned everywhere but here! In my browser window, it looked like I was looking at a CNN Report on Forbes.com. 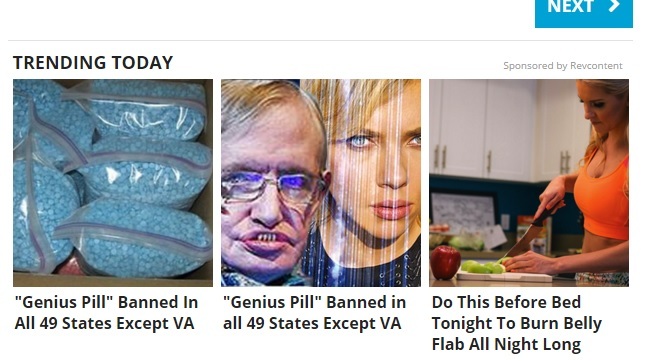 Interestingly, my browser thinks this is a Geniux ad. They really are sloppy about updating the software for the new names, although at least this time the right name is on the bottle. This is getting old. The fake CNN report featuring Anderson Cooper, Stephen Hawking, Bill Gates, Denzel Washington and others talking about how much smarter they have become for taking a certain smart pill is now being used for something called "Adderin" If you've been here before, you know that the same ad has been used to sell Neurocell, Synagen, Cogniq, Alpha ZXT, Intellux, and others. 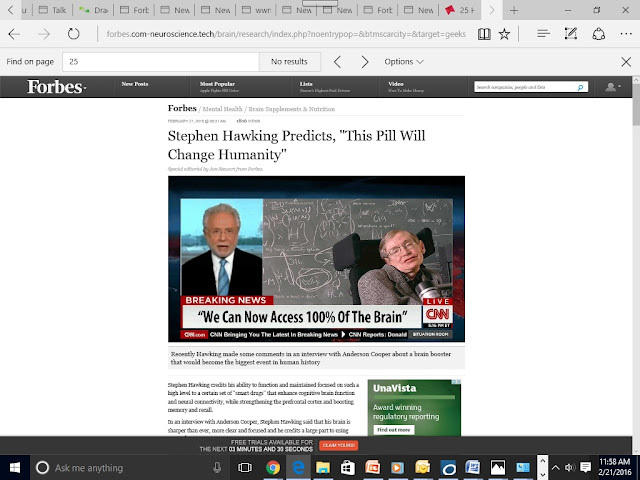 Stephen Hawking Predicts, "This Pill Will Change Humanity"
Special editorial by Jon Stewart from Forbes. In an interview with Anderson Cooper, Stephen Hawking said that his brain is sharper than ever, more clear and focused and he credits a large part to usingAdderin. Hawking went on to add "The brain is like a muscle, you got to work it out and use supplements just like body builders use, but for your brain, and that’s exactly what I’ve been doing to enhance my mental capabilities". Everyone that has taken this, from athletes like Tom Brady to musicians like Kanye West have nothing but praise for the brain booster, which doubles IQ, skyrockets energy levels and connects areas of the brain not previously connected.Adderin works so well for these guys, we had to ask... Is it safe? Today, those scientists made the breakthrough they were seeking and made thediscovery of a lifetime.They came up with a brain boosting smart drug that surpasses all limits of known science. Sometimes, just one simple decision can drastically change the course of your life. Literally, one click could be the difference between living paycheck to paycheck and taking a bus to work to owning mansions, yachts, private jets andnever ever having to worry about money ever again. 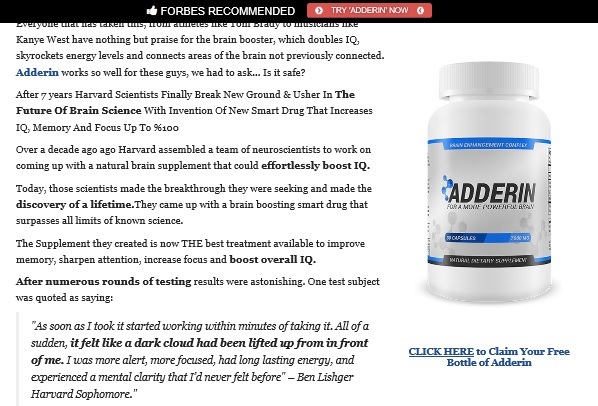 CNN broke the news first and uncovered that Adderin raises levels of focus and performance every day by 300%. As we researched, we began to see that this supplement has been quickly gaining traction around the world. Celebrities and athletes alike are already rumored to be taking the pill with the full scale public release expected shortly. The company and product is called Adderin. The site claimed that Adderin contained a very unique formulation of natural vitamins and minerals which together unlock untapped parts of the human brain. Our resident brain scientist Dr Raqif conducted his own independent analysis of the supplement and his findings seemed to mirror Adderin's claims. According to Dr Raqif, "he's never seen a food based supplement deliver such a profound upward lift in brain function before". Genius Steven Hawkings has Admitted To Using Adderin To Triple His Memory. After our research led to such positive reviews, we simply had to try Adderin ourselves to verify whether this was all hype. Almost every single man in the building volunteered to test it out but we chose our very own Anderson Cooper. Below is his account of using Adderin over a 4 week period. Anderson has been with us for years. "The Adderin pills were extremely hard to come by" says Cooper. He goes on to say, "If you can get your hands on these pills - get them right away." We had to wait 2 weeks before we got a bottle to test as it was sold out almost everywhere or over $300 a bottle from people trying to sell it for profit eBay People were paying top dollar for them on there. 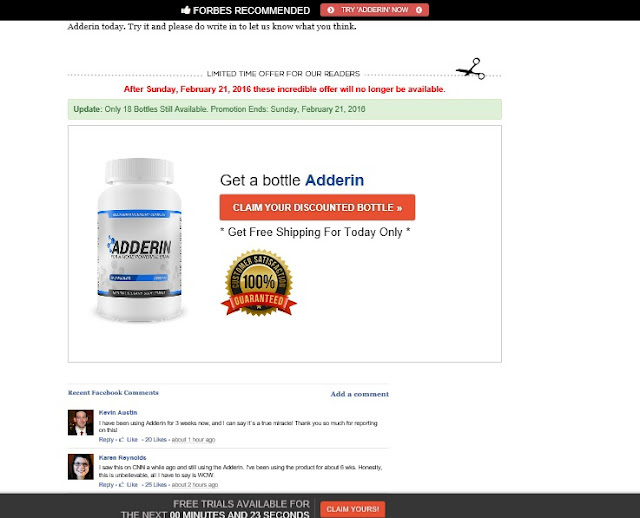 Adderin arrived within 4 days of having placed my order Online for the free trials and were inexpensive to ship. To test out the product, I took one Adderin pill every morning for 4 weeks. With the full market release of the supplement scheduled for later this year, Adderin is bound to make a splash. Experts say government intervention is likely to limit the release of the supplement due to its potent effects. That said, the company is offering limited bottles of the supplement for the next few weeks. See below a men's health special promotion for you to get a discounted bottle of Adderin today. Try it and please do write in to let us know what you think. After Sunday, February 21, 2016 these incredible offer will no longer be available. I have been using Adderin for 3 weeks now, and I can say it`s a true miracle! Thank you so much for reporting on this! I saw this on CNN a while ago and still using the Adderin. I've been using the product for about 6 wks. Honestly, this is unbelievable, all I have to say is WOW. I am amazed after using Adderin. I saw this on the news. How lucky is Jon Stewart to have found this opportunity!?!?! Thank you for sharing this tip! I just ordered. Hey Jon Stewart, i just placed my order. I can't wait to get them!! Thanks, Aimee xoxoxo. Click Here for Your Free Bottle of Adderin! It occurred to me that perhaps this could be considered trademark infringement. Consumers glancingly familiar with ADHD medication might have heard of Adderall, which is used to treat ADHD, and which is a real thing. I'm not saying Adderall is any better than any other ADHD medication, I'm just saying that it is a real drug, with methampetamines and everything, and helps improve concentration in ADHD sufferers, so it really is a smart pill. Anyway, that's for the makers of Adderall to worry about. Thanks for your diligence with exposing these false news reports. I really wish more people would Google these claims that are too good to be true before "spreading the word" on social media & getting ripped off. I think most readers see the point, as demonstrated by the comments of most commenters. Just to recap, the most obvious point is that the same "CNN report" is being run for about 10 different pills -- obviously Stephen Hawking isn't taking and promoting all 10 of them in exactly the same way, and Anderson Cooper didn't do 10 identical trials with 10 different drugs. So that means that at least 9 of the 10 drugs are scams, and the celebrities' names are being used without permission. But really, it's all 10. It's obviously a completely fake report, for a whole bunch of reasons. Why aren't the celebrities objecting? Probably because to do so would be more trouble than it's worth for them. And quite possibly there's not much they can do to stop these fake reports. I don't know. I sure wish they would do something -- maybe we can somehow shame them into taking action. i pressed on the button to order 1 bottle and they charged me for 5 bottles $174.95 now I'm in the process of trying to get this order stopped....its a shame how these people are able to rip folks off...I live on a fixed income of $730 a month but i thought if it could help me get some clarity it would be worth the $39.99 so what the heck i will try it. So imagine my shock when I check my account and seen $174.95 had been deducted from my monthly $730. but thats not the only thing it did, they also charged me $44.42 for a subscription to 'GameSpace' which thank god there was a phone number by that charge...so I called the number and it was an enrollment into a brain exercise site, which no where does it say anything about charging you for this amount or enrolling you in such a site, I was able to talk to a person when calling the phone number and supposely have terminated this and should be getting credited back the $44.42 that was deducted from my account....as of today 4/2/2016 its been 3 days since this happens they still havent credited my account back but she said it would take 7-10 business days...which leads me also to question why is it that the money can be deducted right off your account but takes 7-10 days to posted back on....all these sites should be banned. Thanks for posting this -- if the FTC ever gets its act together and starts investigating this scam, this sort of thing is what will get the scamsters in the biggest trouble. Let us know if you ever get your money back. I took this daily for 3 months and nothing changed. My question is what did I really put in my system? What's in this product? There are various websites that purport to tell you what is in some of these products, but there is no way to tell for sure. The good news is that I doubt there is anything truly harmful in the products -- just like there probably isn't anything -- other than possibly a bit of caffeine -- that is actually effective. Thank you, my family nearly got fooled in until I found this article. I say we all ban together, go after the scum-bag low-lifes that pull this crap, and put them in shackles and flog them publicly -- daily. sounds like a plan. If only we could find out who they are. Where is the FTC and the rest of the government watchdogs on this sort of thing?